First off, how can you not like a name like "Chick-a-Biddy"??! Second, you'll like it even more after you've had the food! A few days ago, a friend and I decided to meet up for a late lunch. Because it was a nice day, we decided to head over to Atlantic Station, since it always provides such a nice atmosphere as well as after-lunch shopping. We decided to eat at a place we hadn't tried before and settled on Chick-a-Biddy. 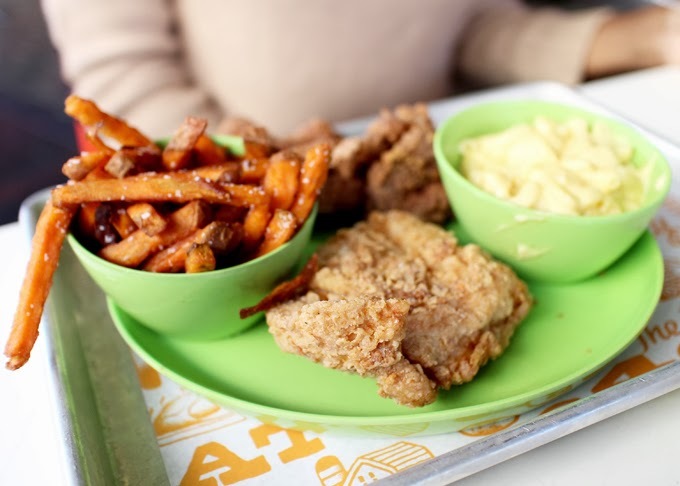 Chick-a-Biddy and it's sister restaurant, Bantam & Biddy are the brain child of two known Atlanta chefs, Shaun Doty (of "Yeah! Burger" and former owner/head chef of "Shaun's", what was an excellent restaurant) and Lance Gummere. 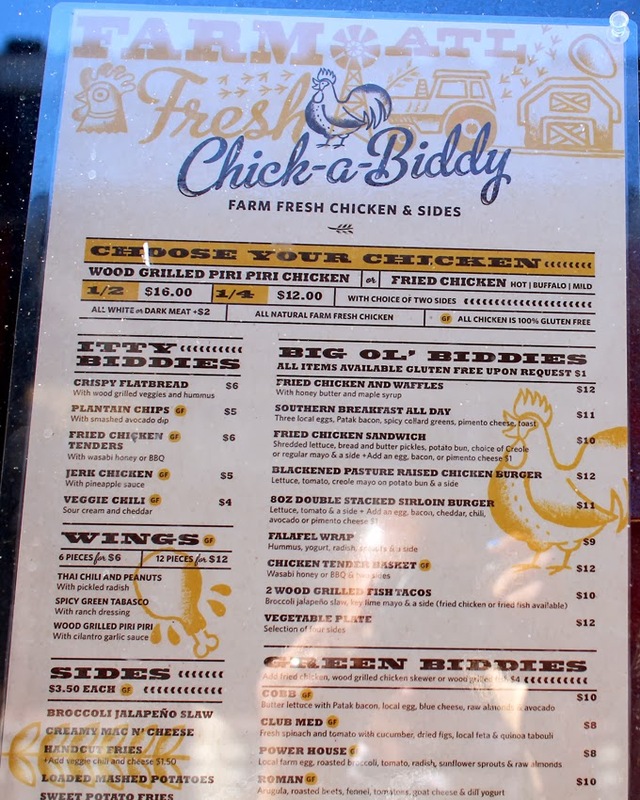 Chick-a-biddy boasts that it only serves "farm fresh chicken", but it also has a lot of other items on the menu as well. My friend chose the fried chicken with mac-n-cheese and sweet potato fries. 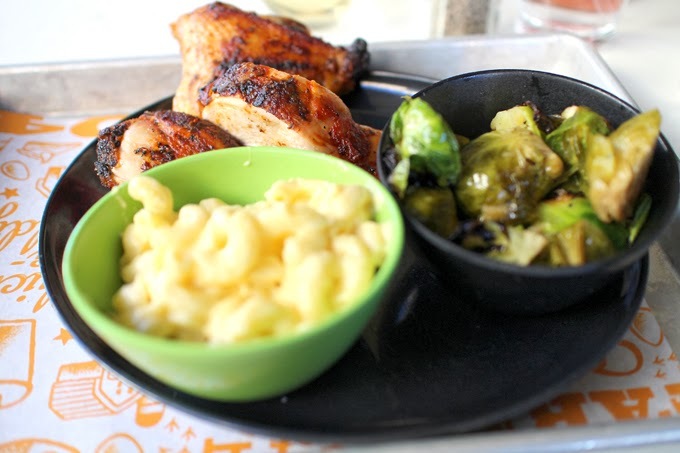 I, however, decided on the piri piri chicken with mac-n-cheese and sauteed Brussels sprouts. Let me tell you, all of it was good....but those Brussels sprouts were thee best Brussels sprouts I'd ever had in life. The mac-n-cheese looks sort of "regular", but it was really good as well. Last, the chicken was flavorful and I liked the piri piri spices. My friend said that her fried chicken was winning as well. The only negative--I do not go to restaurants to be served wine in stemless glasses! Even though, it's a casual restaurant, I just have something against drinking out of stemless wine glasses when I'm out on the town. I didn't get any photos of the restaurants interior because we decided to eat on the patio. The patio is really nice and is in a good spot for people watching. The inside decor is really cute, and reminds me of places in Miami. It has a very modern styling with a white & orange color scheme. I look forward to going back and trying some of the other menu items. 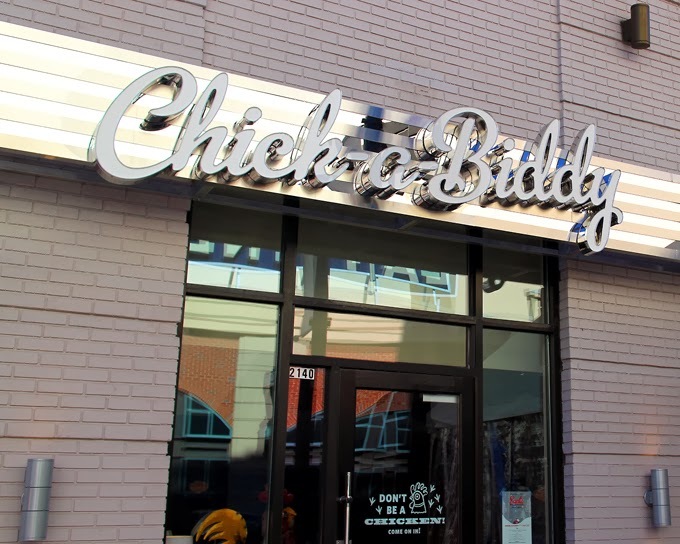 If you're ever in Atlanta, go hang out in Atlantic Station and definitely give Chick-a-Biddy a try! You should! I plan on trying out Bantam & Biddy next. That one gets better reviews on Yelp, so I'm very curious. Right so they serve wine in a cup? :/ Looks good though. Yes! It definitely killed my vibe somewhat. That was the only negative, though.